A.J. Turner rises for a two-handed slam. The junior forward had 24 points Saturday against DePaul. Northwestern came back from a 15-point deficit in the second half against in-state rival DePaul on Saturday to ensure a 75-68 victory in a tightly-contested home matchup. With just under ten minutes left, DePaul guard Devin Gage hit a two-point jumper that put the Blue Demons (5-1) ahead 57-42 over the Wildcats (7-3, 0-2 Big Ten), their largest lead of the game. To this point, DePaul had not once surrendered the lead and appeared to be en route to a comfortable victory. NU, though, had other plans. Over the next seven-plus minutes, the Blue Demons watched as the Cats scored 25 unanswered points and amassed a 10-point lead. 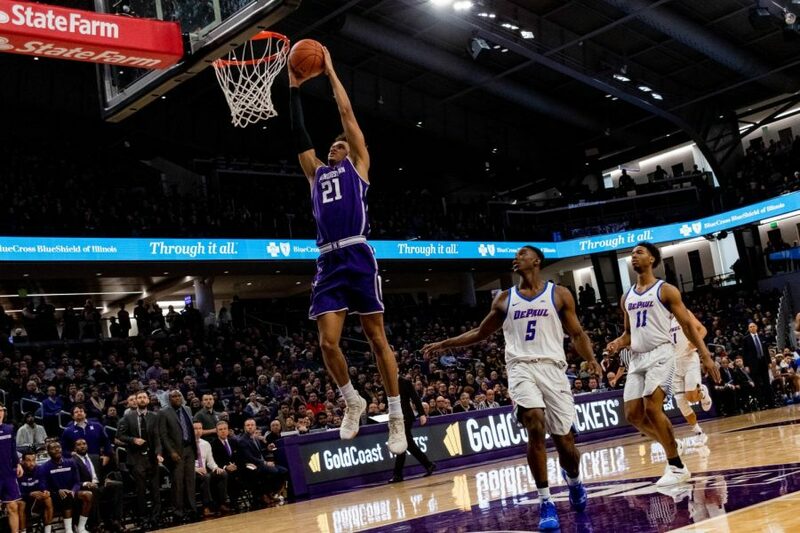 During the stretch, NU’s shooters lit up a rowdy Welsh-Ryan Arena, led by six consecutive three-point field goals by senior forward Vic Law, junior forward A.J. Turner and graduate guard Ryan Taylor. At the heart of that grittiness were Law and senior center Dererk Pardon. The unquestioned leaders of the team, Law and Pardon combined for 35 points and 15 rebounds, and carried the team defensively throughout the 25-0 second half run. During the stretch, Law himself scored seven unanswered points as the Cats marched into the lead. Pardon, who was double-teamed by the Blue Demons nearly every time he touched the ball, still managed to impact the game in big ways, finishing with double-digit points, four key blocks and eight rebounds. Though it was undoubtedly Law and Pardon’s leadership that helped will NU to victory Saturday, it was the breakout shooting performance of Turner that stole the show. Turner, a transfer from Boston College, is playing in his first season in purple after sitting all of the last year as a result of NCAA transfer rules. Turner said that while it was tough not being able to play, he took the time as an opportunity to get better. After some inconsistent shooting in the first several outings this year, Turner finished Saturday with 24 points and six three pointers. The victory capped off a tough stretch of games in which the Cats played seven games in just over two weeks, including three over a four-day stretch in the Wooden Legacy Tournament over Thanksgiving. Though NU won an impressive four of those seven games, it lost two heartbreakers to Indiana and Michigan, both by just two points. Collins says the forthcoming break gives the team much needed rest and time to work in new sets in practice. The Cats next game is at home on Dec. 17 against Chicago State, another in-state competitor. “I’m anxious to have the next eight days to get on the practice floor and continue to shore up our execution, our late game stuff, and things like that,” Collins said.